How do you bring new technology into a building and institution that embraces history as an integral part of its brand? There may be many answers but in the sports stadium world, Notre Dame’s renovation of its hallowed football stadium and the addition of high-speed Wi-Fi look like a good example for any other venues trying to solve the same issues. 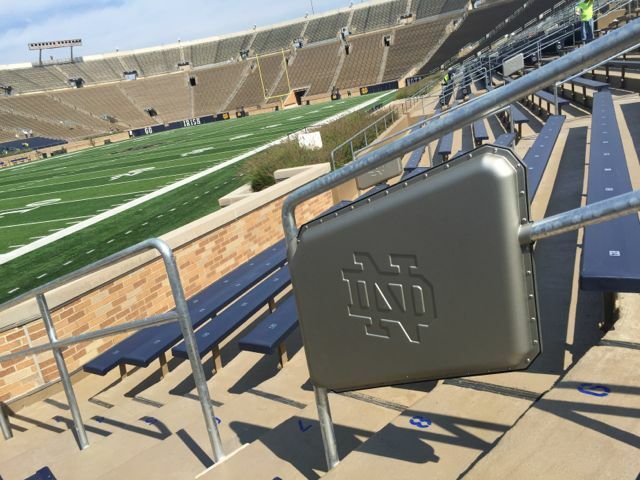 As part of its $400 million “Campus Crossing” stadium renovation, the University of Notre Dame made adding a high-definition stadium Wi-Fi network a priority, according to Rob Kelly, associate athletics director of ticketing, premium and technology for the school. Though such big projects often face budget trimming en route to completion, Kelly said the network was never on the chopping block. Editor’s note: This profile is an excerpt from our latest STADIUM TECH REPORT, our Fall 2017 issue that has in-depth profiles of network deployments at Sports Authority Field at Mile High, Colorado State’s new stadium, and the Atlanta Falcons’ new Mercedes-Benz Stadium. DOWNLOAD YOUR FREE COPY of the report today! 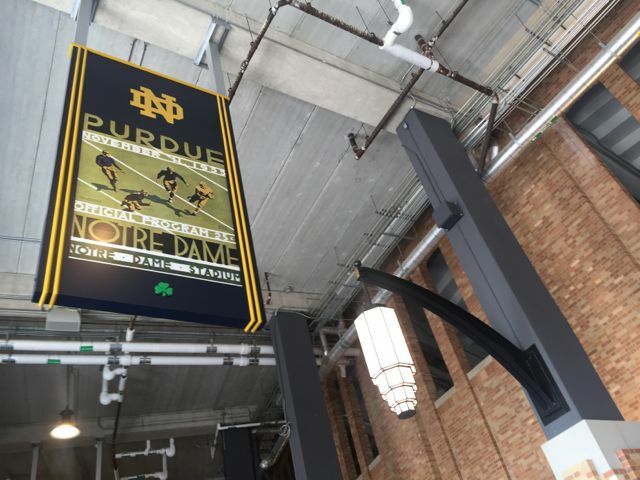 Future aside, the new technology reality at Notre Dame Stadium is a huge step forward for a facility that first appeared in 1930, when the legendary coach Knute Rockne led the Fighting Irish football team. Since then the old concrete oval underwent only one significant upgrade, a 1997 enhancement that added another ring to the top of the stadium, boosting capacity from 59,075 to 80,795. The Campus Crossing project, however, takes Notre Dame Stadium into a new era completely. By basically building three new buildings onto the back of the east, west and south sides of the stadium, Notre Dame added the ability to now have expanded premium club areas and seating sections, added classroom and other office space, and the ability to finally have a huge TV screen to show replays, a big upgrade to the experience from the Notre Dame games of the past. Thanks to the video board, “we won’t have to text family or friends not at the game to find out if a player was in or out of bounds,” said Kelly. 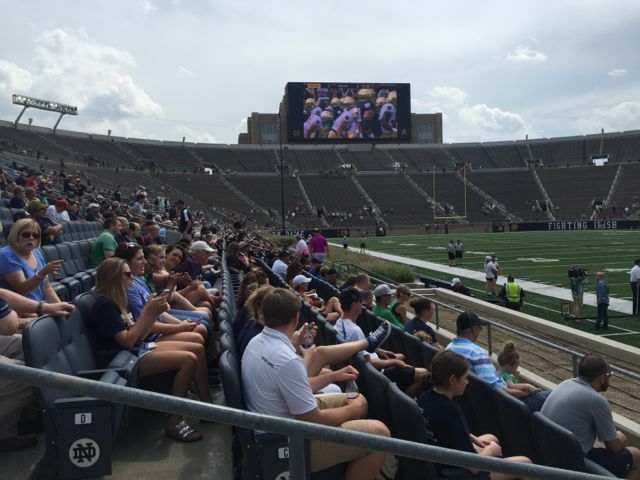 Though the tradition of attending a game in the same facility where legends like Rockne, Ara Parseghian and Joe Montana roamed the field is part of the game-day attraction, Kelly said that Notre Dame fans’ visits to away games made them well aware of amenities that were becoming commonplace elsewhere. “That old saying about ‘you don’t know what you don’t have’ just wasn’t true anymore,” said Kelly, who notes that currently most Notre Dame seasons will see the team playing in one or two NFL venues for prime-time contests. Brought in right at the start of the Crossroads project, Kelly said he had to become an “instant expert” on premium seating and on technology, especially on the Wi-Fi front. That wasn’t all bad, since it meant multiple visits to other stadiums to evaluate their technology deployments and seating options. On the Wi-Fi front, Notre Dame paid special attention to Wi-Fi deployments in Green Bay (since Lambeau Field is similar to Notre Dame Stadium in construction and layout) and in Minnesota, where the new U.S. Bank Stadium had opened. The biggest question for Notre Dame’s Wi-Fi deployment in its no-overhang exposed bowl was about which method would be used — with the early leaders being under-seat or top-down placement of Wi-Fi APs. According to Kelly, a railing-mounted solution like the one used at U.S. Bank Stadium was not originally given much thought, mainly because the lower bowl seating area at Notre Dame Stadium didn’t have any handrails. Though the new top part of the bowl required handrails for safety regulations when it was added in 1997, the lower bowl was historically exempt from those considerations, Kelly said. Notre Dame information architect John Buysse, one of the leads on the school’s network team, said the first reactions during network planning meetings rejected the idea of Wi-Fi on railings, with debate suggesting that the lower-bowl aisles weren’t wide enough. Under-seat deployment AP would be a challenge as well, for both the extra cost of drilling more holes through the concrete — many at locations “below grade,” or in the dirt, since the playing field is well below ground level — as well as a lack of space between the floor and the bench seats. “Whoever had an AP [under the bench] would be miserable,” Buysse said. Somewhere during the process, however, a survey of alumni found that the lack of railings in the lower bowl was a serious safety concern, especially during the rainy and snowy parts of the season. 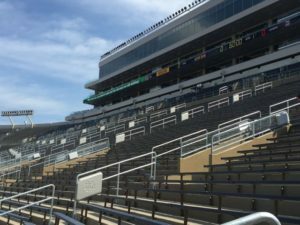 “The alumni complained about how difficult it was” to negotiate getting to their lower-bowl seats without any handrails, Buysse said. With the ability to score a double positive with one move — adding handrails for safety and for Wi-Fi — the railing-mounted AP plan moved in for the win. So far this season, the network has already performed like a winner. For Notre Dame’s Sept. 9 home game against Georgia, the network saw 6.2 terabytes of data used, the highest total ever recorded for a college football game. It also didn’t hurt, Kelly said, to make a double positive from a single move. 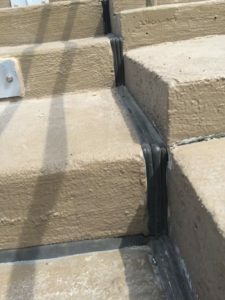 “Adding handrails [for safety] was a positive, and better connectivity was another positive,” Kelly said. And the fact that the enclosures look cool — with a snappy ND logo embossed into each cover — also probably doesn’t hurt. The custom AP enclosures with the ND logo embossed into the molded plastic were courtesy of AmpThink, a Dallas-area firm that in most of its previous history had provided its Wi-Fi skills in a specialist or subcontractor role where it had full responsibility for network deployments. But with an increasing amount of experience in its resume — including doing designs for several of the recent Super Bowl networks, as well as new network installs at Texas A&M University and U.S. Bank Stadium, among others — AmpThink bid and won the lead on the Notre Dame Wi-Fi project, another football-size stadium project on a list that also includes the renovated Wi-Fi network at the Carolina Panthers’ Bank of America Stadium in Charlotte, N.C., and the ongoing renovation at the Alamodome in San Antonio, which will host the 2018 NCAA Men’s Final Four. In AmpThink, Notre Dame found a partner not just with technical skills but also with the appreciation with how making things that look good as well as perform well matters. One look at the custom Wi-Fi AP handrail enclosures tells you a lot about this commitment, when you see the sharp, widely recognizable yet understated “ND” logo stamped into each ABS plastic casing. AmpThink execs showing off the gear during a recent tour pointed out details like the slightly roughened surface, finished that way to keep any scratches from showing. AmpThink also made sure all the logos were horizontal when installed, no small feat with numerous different angles of slope on various railings. “There are different [railing] angles all over, and only one of the ones AmpThink delivered didn’t match — and they had a spare to fix it on hand,” Buysse said. “AmpThink has been a tremendous partner,” said Kelly, noting the early help AmpThink provided by bringing in demo units to mock up what the deployment would look like. Of the 1,096 total Wi-Fi APs in the new network, a full 685 serve the seating bowl, Buysse said. For the below-grade APs located near the bottom of the seating bowl, AmpThink and Notre Dame brought bandwidth to the railings by drilling a trench down the sides of stairways and covering the cables with rubber gaskets afterward. The APs in the bowl are mainly Cisco 3800 units, which have two radios each. Buysse said the bowl network will be exclusively on 5 GHz channels, like many other stadiums these days. AmpThink’s engineering ingenuity is apparent in other places as well — for flat-ceiling AP locations like those in suites, the firm developed an AP enclosure that can be installed by one person, instead of having to have electricians and other construction specialists teaming up to get all the work done. It might not sound particularly interesting, but when you are installing hundreds of APs in far-flung locations, finding a way to save time on each one ends up being a big benefit in the end. 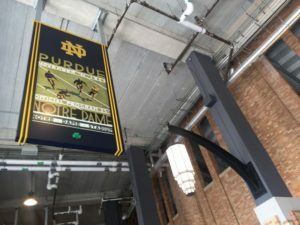 Even with all the new construction the main concourses of Notre Dame stadium have successfully combined the old hallowed-ground feel with modern amentities like new and more concessions stands, as well as Wi-Fi and DAS antennas painted and mounted in ways to keep them out of direct sight. Our speedtest in the concourse area showed a connection of 70 Mbps on the download and 52 Mbps up. Crown Castle built and operates the neutral-host DAS, which already has AT&T and Verizon Wireless working with T-Mobile set to join in soon. Though there weren’t any fans on hand yet, our speedtests taken in late August were impressive, with Wi-Fi readings of 69 Mbps on the download and 70 Mbps on the upload in the upper deck benches on the stadium’s east side; we also got a reading of 67.56 / 68.68 inside the new premium club area on the west side; and a test of Verizon DAS connections at 46.68 / 11.39, also on the west side of the stadium. 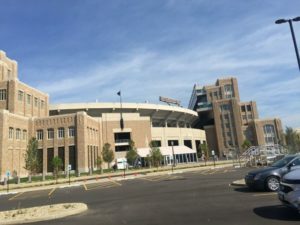 The next tale to tell from Notre Dame Stadium may be on the content and application side, where the Fighting Irish are just getting ready to play with their new toys. At the SEAT Conference in Atlanta this summer, Notre Dame execs talked about starting slow with the stadium mobile app, not trying to do too much so that fans wouldn’t be turned off by the approach if features failed. For this season the app will focus mainly on digital ticketing, allowing fans to show tickets, transfer tickets via email, or donate unused tickets back to the university. Kelly said the school will explore using a portal for Wi-Fi login in the future, to “reinforce” the value of the app. On the video production end, the building on the stadium’s west side provided the space to create a multi-headed content production facility that hosts the new “Notre Dame Studios,” an internal startup of sorts that will centralize all kinds of video and streaming production not just for sports but for all the content being created all over the South Bend, Ind., campus and beyond. For football game days, the production facilities can be used by network crews, who no longer will need to bring a separate production truck to the venue. For Notre Dame fans, the improvements bring the facility well to the forefront of the connected-stadium world, as well as for premium seating, especially for those with access to the rooftop club areas, where fans can relax on outside couches with an excellent view of the field, a commanding view of the greater South Bend landscape, and excellent connectivity for their mobile devices. All in the old stadium with its sturdy brick-and-concrete foundations, and the statue of Rockne out front, ready to shake down the thunder and then share that experience on Facebook or Snapchat. But, Kelly added, he’s also “never heard that people don’t want better cell coverage.” While the changes may be startling to veteran Notre Dame fans — especially the video board — Kelly thinks the end result will be another positive, as the practice of combining technology and tradition with a commitment to quality becomes apparent. “I think everyone will be pleasantly surprised,” he said.